The drone industry is another wild, wireless world in need of technical leadership for its wireless connectivity. If it’s wireless, it’s Qualcomm. Seems like where ever wireless has journeyed over the past thirty years, Qualcomm (NASDAQ: QCOM) has either led the charge or occupied the head chair in pioneering the necessary technology for advanced wireless connectivity, performance, and communication. Today, with the quickening of the drone industry seemingly everywhere at once — which is another wireless behemoth on the rise — Qualcomm finds itself once again snuggled into another head chair. Investors have pumped $210 million into drone technology so far in 2015, almost double the total for all of last year, according to Bloomberg Business. “Everybody wants to invest in drones because they’re seeing not only the potential, but actual results right now,” claims Jon Ollwerther, vice president of marketing and operations at drone builder AeroCine. Drones definitely have the ear of the big money people: “It’s blindingly obvious to us that this is going to be a big space,” says John Frankel, founding partner of ff Venture Capital. Every drone, like nearly every cellphone before it, will use some of Qualcomm’s over 2,000 patents in 2G, 3G, 4G, and 4G LTE networks. The company is already exploring the future of 5G networks that will provide an integrated, distributed platform for computing, storage, network resources as well as connectivity. The chart below was used at Qualcomm’s most recent analyst meeting (July 2015). Then again, nothing lasts forever, or does it? According to Strategy Analytics, Qualcomm owns 61% of the global 3G/4G mobile market and 70% of the LTE market. A strong second place at ten percent is held by Taiwan’s MediaTek, and third place goes to Samsung, which recently opted to use its own technology, instead of that of its former supplier Qualcomm. Next to Apple, Samsung was Qualcomm?s second largest customer. Going forward (beginning with the Galaxy S6 model), Samsung will use its own technology and not Qualcomm’s to power its millions of cellphone devices. Competition for the greater cellphone universe is on the rise: last year Qualcomm had a 90 percent share in LTE, which has now dropped to 70%. The loss of Samsung’s business and a $975 million fine by China for violating its anti-monopoly law, plus shares losing 22 percent of their value, closing most recently at $63 per share — near its 10-year low — have put a major crimp in revenue for 2015. Qualcomm reported revenues of $26.49 billion, up 7 percent y-o-y for 2014. That is exactly what a fledgling drone industry needs: a technology leader with massively deep pockets, a brilliant engineering pedigree established by industry icons and company co-founders, Irwin Jacobs and Andy Viterbi; a pair of empire builders who are arguably the founding fathers of wireless communication; a research powerhouse that doesn’t shy away from spending large on R&D, even if shareholders get annoyed; plus an energetic investment group constantly on the prowl for new technology. Mesh is a little gift Qualcomm can use while taking its chair at the Internet of Things (IoT) party. “Bluetooth plus Mesh will be the backbone of the Internet of Things, and Qualcomm’s acquisition of CSR and its Mesh protocol puts it way ahead of other players in the emerging IoT ecosystem,” reports Seeking Alpha. A year earlier, Qualcomm released the source code of AllJoyn, a contender that may become a future standard for device-to-device communication and functionality. Sharing a home together with Qualcomm is Brain Corporation, co-founded in 2009, with initial funding from Qualcomm, by computational neuroscientist Eugene Izhikevich. Known for creating a computer model that simulates the same number and speed of neurons and synapses as the human brain, Brain’s work is uniquely adaptable to both drones and robots. Speaking of sharing space together, Qualcomm is also home to the most recent Techstars incubator — the first robotics-only Techstars startup pod. Interestingly, more than half of these newbie autonomous machine builders are drone makers. And now, Qualcomm has gone out and acquired a drone company of its very own. A good one! Named for its co-founders Alex Kushleyev and Daniel Mellinger, KMel Robotics, is cut from the same cloth as its mentor, Vijay Kumar’s General Robotics, Automation, Sensing and Perception (GRASP) Lab at the University of Pennsylvania. “Kumar is known for his expertise in developing autonomous ground and aerial robots, and in designing bio-inspired algorithms for robot swarms.” KMel Robotics is as well, until it got very quiet all of a sudden. 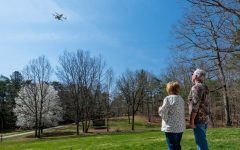 Now in its formative stages, the drone industry is another wild, wireless world in need of technical leadership for its wireless connectivity, performance, and communication. No doubt the drone industry’s R&D establishment must also be feeling quite comfortable as well with Qualcomm’s strong commitment to drone technology. To fluff up the comfort level even more, Qualcomm Research continues to build out the core technologies that enable both rolling and flying autonomous robots via a computing platform built around its Snapdragon processor. Not half bad for a company that began life in 1985 in a tiny office at a La Jolla strip mall above a pizza place and a dry cleaners. A band of geniuses who transformed a forgotten military technology first used during World War II into its biggest corporate prize: CDMA for Code-Division Multiple Access. Quality Communications, as it was known back then, has since amassed a staggering trove of wireless patents and other intellectual property that now provide for half of its yearly profits. Profits enough that put the company on the Financial Times Global Top 50 companies for 2014, just a little below Disney, but considerably higher than PepsiCo. And enough respect for its achievements that the head chair at the drone party is very well deserved. And as an oh, BTW, Samsung is rumored to be rethinking its Qualcomm connection: the Galaxy S7 reportedly may use Qualcomm’s new next-generation processor Snapdragon 820, so hints Android Headlines. Fancy that.